Mr. Kyre is a graduate of Mifflin High School. He began playing percussion in 1973. His instructors included Rick Brunetto (Dr. of Percussion The Ohio State University), and Joe Ong (Percussion professor, Capital University). During his high school career, Mr. Kyre was squad leader of the marching band percussion section for three years; he also participated in concert, jazz, orchestra, and symphonic band. Mr. Kyre taught privately for several years, and then took a break and just played for his own enjoyment. He has continued his education with small class instructional clinics at Columbus Percussion. He began his time at Hamilton Township High School as a band parent volunteer in 2006, an organization in which he is still an active member. 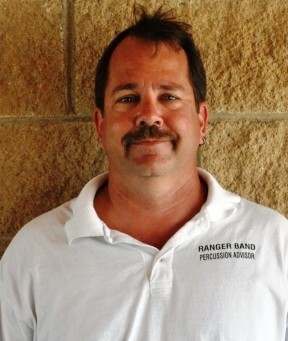 In addition to his teaching of percussion, he drives the band truck, supervising the loading and unloading of all equipment, and coordinates arrivals at all away band events. Mr. Kyre has also built many of the carts needed to transport band equipment. He uses these same skills to help with the Hamilton Township Drama dept. needs, and is an adult stage crew leader. When not at the High School for Marching Band, Concert Band, or Drama, Mr. Kyre is an avid hunter and fisherman. He enjoys spending time with his family and in the outdoors. He is a welder/fabricator and woodworker. From 7-3 he is a heavy equipment mechanic for the city of Columbus, and teaches the Division of Water CDL drivers training course. Beyond the high school, Mr. Kyre volunteers with his church, is a blood donor and participates in the Walk for Diabetes annually.